Abstract: This paper presents an extremely rare case of synovial sarcoma arising from the maxillary sinus, which resulted in a clinically complete response to chemotherapy. Synovial sarcoma is a rare soft tissue malignant tumor, most commonly affecting the extremities. While ~10% occur in the head and neck region, synovial sarcoma of the sinonasal tract is extremely rare, with only 11 cases having been reported previously. As with other sarcomas, the standard treatment is complete resection while allowing for a safe margin, but this is often difficult in the head and neck area due to the complicated anatomy there. This makes the treatment of head and neck sarcoma challenging and leads to the need for a multimodal approach in advanced cases. However, the exact efficacy of chemotherapy is not well understood. 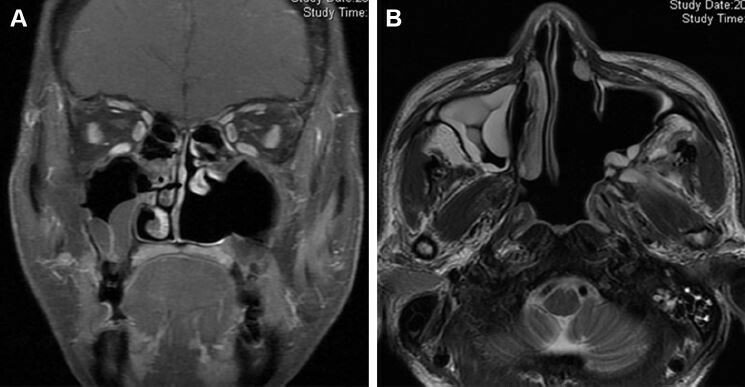 In this report, we present a case of unresectable maxillary sinus synovial sarcoma that was successfully treated by chemotherapy followed by radiation therapy. A 53-year-old Japanese man was referred to our hospital with a history of left nose obstruction over the previous couple of years. Computed tomography/magnetic resonance imaging revealed a tumor arising from the maxillary sinus that extended to adjacent tissues. A biopsy was performed, and the tumor was diagnosed as synovial sarcoma. Since the tumor was unresectable, neoadjuvant chemotherapy was administered. The response was excellent, and the tumor became undetectable under endoscopy and radiological imaging. This provided us with a clinical evaluation of “complete response”. The treatment was concluded with definitive radiotherapy and two more cycles of adjuvant chemotherapy. The patient remains free of disease 12 months after treatment. Synovial sarcoma of the head and neck is a rare entity; complete resection is the treatment of choice but (neo)adjuvant chemotherapy can be considered in unresectable cases, as we show here in the present case.